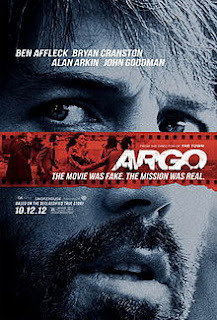 You have to admire the intelligence of Argo. It’s The Producers meet the ur Arab Spring, the ur Benghazi, aka the Iranian hostage crisis. What’s even more brilliant is that it wasn’t even invented. It’s a Duchampian found object in genre entertainment form, a little jewel discovered courtesy of Joshuah Bearman’s 2007 article in Wired, Chris Terrio’s screenplay and naturally the work of the director Ben Affleck who also stars as a real life CIA operative named, Tony Mendez. Run and see the film if you want to be laughing courtesy of John Goodman and Alan Arkin playing later day versions of the characters Gene Wilder and Zero Mostel immortalized and sitting on the edge of your seat courtesy of history. “If I'm going to do a fake movie,” Arkin says at one point. “It’s going to be a fake hit.” Here Argo reaches the realm of higher math and the cinematic equivalent of imaginary numbers. It’s a movie based upon a movie which wasn’t, as the original script for Argo, a sci fi fantasy set in the Westerner’s idea of the Orient viz Edward Said’s Orientalism, was exhumed from turnaround for the sake of the rescue mission that’s dramatized. Another great line from the movie is a comparison of the escape operation to abortion. “You don’t want to need one, but you don’t want to do it yourself.” It’s terrific fun to willingly suspend belief about something so unbelievable--that also happened to be true.